Schwabe provides stem-to-stern counsel for maritime businesses—from ships to shipyards to shippers and from one fish boat to a fleet. Schwabe lawyers believe deeply in the maritime industry as the essential foundation for global trade and regional growth. We are courtroom lawyers and we are contract lawyers but, first and foremost, we are dedicated maritime practitioners. 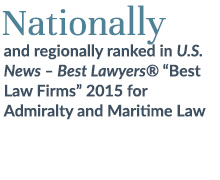 Like our clients, we’re drawn to maritime work because we know just how unique our industry and its legal challenges are. And we wouldn’t want it any other way. Obtained six-figure recovery for specialty marine construction client after dangerous flood conditions disrupted a major Portland bridge construction project, necessitating emergency disaster mitigation and marine salvage procedures. Achieved summary dismissal of a six-figure salvage claim against a vessel-owner client by educating a state-court fact-finder on complex nuances of federal maritime salvage law. Led coalition of Washington ports in multi-year permitting effort to deepen the Columbia River navigation channel to 43 feet (completed 2010). Assisted a coastal port client with the permitting needed to make it the new home for NOAA’s West Coast fleet. Serve as outside General Counsel to the Columbia River Steamship Operators Association (CRSOA), providing representation on pilot tariff litigation and other work before the Oregon Board of Maritime Pilots and Oregon and Washington legislatures and administrative agencies since 1989.